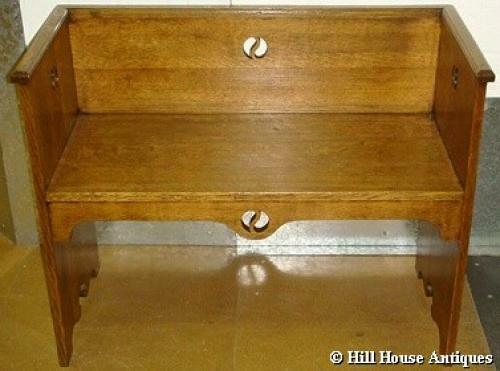 Stylish Arts & Crafts medium oak hall or window seat of compact form, with yin/yang cut-outs to front and sides, shaped scrolling feet and metal studs to side panels. Circa 1905. Liberty & Co.
Approx 36.5" wide, 16.5" deep and 29" high. Height to seat approx 18". Similar exhibited in the Liberty Arts & Crafts Exhibition of May 1985.